Artemis Racing was pushing hard to put on a show for its home fans in Gothenburg, Sweden on the official practice day Friday. Unfortunately, that extra push led to a capsize, meaning the team missed out on the two practice races. "That's what these boats are like," said skipper Nathan Outteridge. "We're all out there pushing hard and that's what happens when you push too much." All of the crew were safe and the boat suffered only minimal damage to the wing, which will be repaired in time for racing by the morning. "We're really excited to put on a good show and a good performance," Outteridge continued, saying his team would be ready to go on Saturday. Oracle Team USA and Land Rover BAR each won a race on Friday, the two heavyweights staking their claim early. "We've all seen how close the racing was (in Portsmouth) and one mistake makes all the difference," said Ben Ainslie, the skipper of Land Rover BAR. "Moving into this event, with the race course being that much tighter, all of the teams are getting more experience, it's getting harder to stay ahead on the development curve." Oracle Team USA skipper Jimmy Spithill added: "It's always good to be pushed and go up against the best. We love competition, we love being pushed and that's what we're going to get this weekend." Two races were held in winds in the 16-20 knot range. The stronger conditions were a test for some of the crews who hadn't raced the AC45F foiling catamarans in the strong conditions before. Franck Cammas, skipper of Groupama Team France said: "Yesterday and today was good for us as it was windy, for the first time for us on these boats. So we're still in a learning process, but it's moving the right way." Dean Barker, the skipper of SoftBank Team Japan agreed: "It was good to be back out racing. Today was something pretty cool. Flat water and good breeze. It's a lot of fun in these boats." Meanwhile Emirates Team New Zealand missed out on the competition as well, after a minor breakdown forced the team to return to port early. "Very disappointing. We all love sailing these boats in good conditions and today was perfect - flat water and good winds. So we're thoroughly looking forward to tomorrow and getting stuck in with these guys." 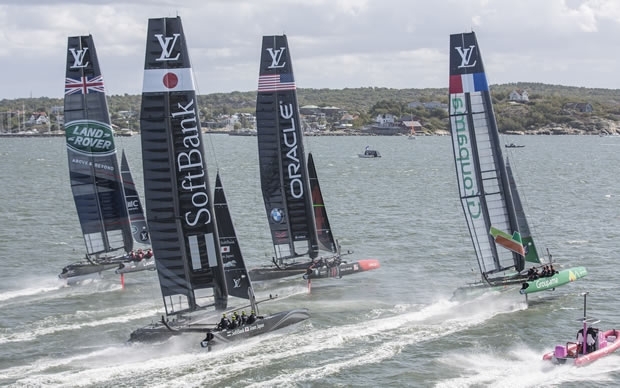 To make it easier for fans to tune in on-the-go, wherever they may be in the world, America’s Cup has launched the new America’s Cup App, available for Android and iOS mobile devices via Google Play and the Apple iTunes store. (The app is not optimised for computers.) The app is free to download and has news, photos and race results.